When hues of scarlet and gold emerge and sunny days dawn crisp and clear, nothing beats the crunch of fallen leaves along an Ozarks trail. 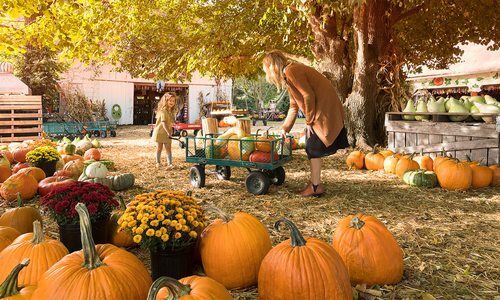 Lace up your boots, grab your camera and hit one of these trails for leaf-peeping—and then some. 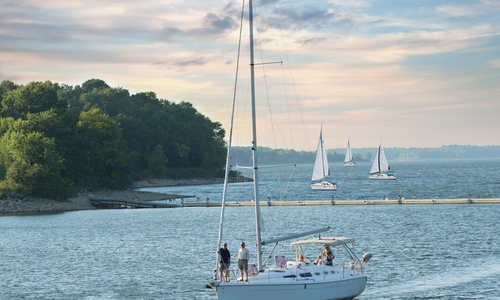 Why it’s great: Plan a picnic and spend the day—or do a little fishing. There’s plenty to explore in addition to your hikes. Park at the scenic hatchery where Deer Leap and Devil’s Kitchen trailheads are in close proximity. 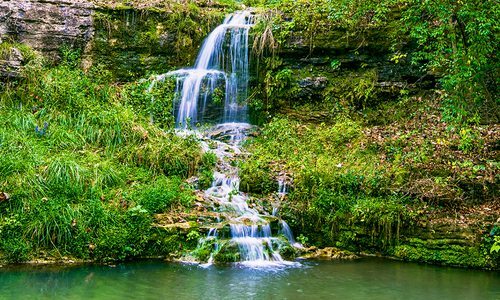 The short but steep Deer Leap Trail starts near the gorgeous blue-green Roaring River Spring. Stone steps lead uphill where the bluff-top trail continues with bridges, boardwalks and scenic overlooks showcasing the spring, pool and hatchery. The rugged Devil’s Kitchen Trail, across the river, features caves and rock formations including a collapsed room-like enclosure that inspired the trail’s name. Why it’s great: This section of the Buffalo River Trail climbs roughly 300 feet, affording wonderful overlook views to the curving river below. The trail features interesting rock formations—including a split rock you’ll pass through—and, during high water, several pretty cascades crossing the trail. Plan extra time to visit the old preserved Villines homestead, which is uphill from the Ponca trailhead. Why it’s great: Few scenes beat Kings River Falls, especially with a backdrop of crimson and gold. Don’t rush this family-friendly hike: Smaller cascades and natural beauty should be savored as you go. While the falls at trail’s end are at their best in high water, you’ll want to linger even if the river is low. And with trees shedding summer wardrobes, you’ll more easily find a volunteer trail just upstream from the falls, leading to more cascades. 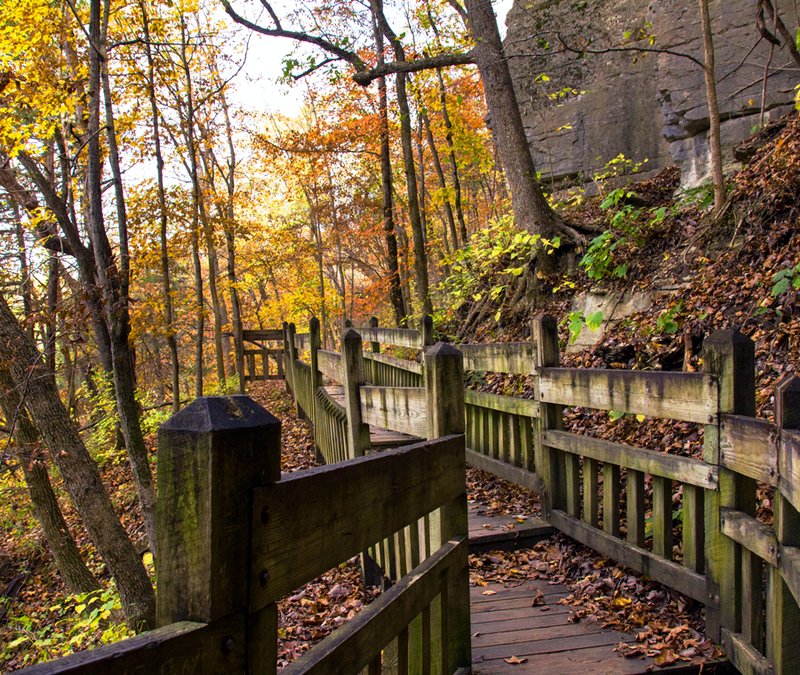 Why it’s great: Located just off 76 Country Boulevard, this scenic trail serves up a workout via 315 stonework steps tucked into a 140-acre sanctuary that includes more than four miles of trails. Those include family-friendly paths around the Owen Homestead area (under renovation after a 2015 fire gutted the house). Before descending Bluff Trail, pause at the hand-built stone wall which overlooks glistening Lake Taneycomo. This trail also leads to a grotto (with a waterfall during wet seasons) and two caves, the second of which is a Civil War hideout. Why it’s great: Busiek’s east side Red Trail winds through wooded areas and climbs to hilltop vistas affording nice fall color views. Photo-friendly landmarks include the Carter Family Cemetery (established 1891) and Woods Fork Creek. Prepare to cross the creek once without a bridge—several times if you connect to the Yellow Trail. It's festival season! 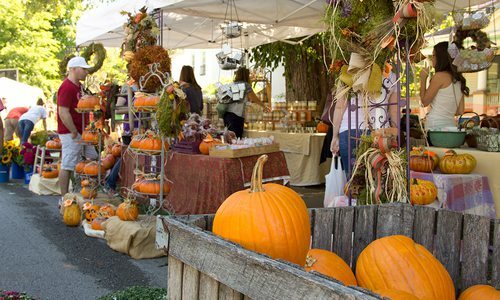 Get out and embrace small town fun with southwest Missouri's best fall festivals.